When you do need marine grade plywood, we’re more than pleased to be able to offer premium Bruynzeel marine grade plywood, with two extraordinary core options and a myriad face veneer possibilities. However, sometimes marine grade plywood isn’t necessary. And in those cases, we’ll recommend that you not purchase those specialty products. While we’re always glad to answer your questions about particular applications or intentions, we’d also like to provide a few guidelines to help you discern whether you need marine grade plywood — or not. To recap our previous discussion of Bruynzeel, we offer two basic marine grade cores: Okoume (or Hechthout) and Sapele (or Super Hechthout). Ideal as a substrate, the Okoume core is strong and lightweight. 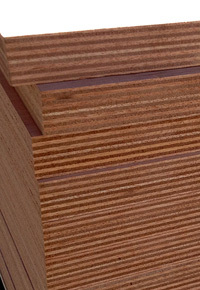 For applications requiring greater density and durability (or that you intend to stain), Sapele provides an excellent alternative. 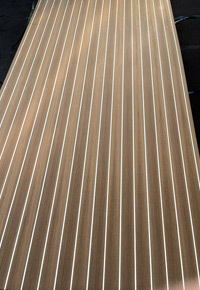 The potential for creating custom panels with specialty face veneers over either of those cores allows us to tailor your marine plywood to the particular requirements of your marine application. However, we don’t recommend our premium Bruynzeel plywood to just anyone, for any old plywood project. We hear the phrase “marine grade” tossed around a bit more than it deserves to be, so when someone inquires about marine grade plywood, we respond by asking a few questions. By technical standards, “marine grade” plywood doesn’t have to meet standards much higher than the typical exterior grade plywood. Just as with regular plywood, grading and pricing can be confusing, since so many factors aren’t accounted for in the grading. Marine grade plywood that needs to stand up to regular immersion in water requires a careful combination of glue, plies, veneers, and preservatives. First, true marine grade plywood will have a core that’s completely free from voids; otherwise, any gaps will become traps for water, which will prompt rotting from the inside. Repaired core plies are equally problematic. In addition, each layer must be attached to the other layers with specialty Weather and Boil Proof (WBP) glue. After being immersed in boiling water for over an hour, the plywood that passes the test will remain free from any delamination. 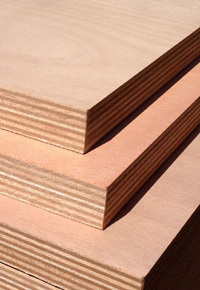 That’s it: a core without voids, plies free from defects, and WBP glue are the only true requirements for plywood to be considered marine grade. Other standards, such as BS 1088 and BS 6566, seem to raise the bar, but in actuality, they only add greater variety to the products available on the market. While we wish that the term “marine grade” were used exclusively to denote plywood that’s cut out for boat building, that scenario is simply not reality. Plenty of so-called “marine grade plywood” would not be well suited to boat building. While BS 1088 or better is an absolute requirement, so many other factors need to be considered, from weight to appearance and flexibility. So simply saying you need plywood that’s “marine grade” is never quite enough information. A savvy lumber supplier will ask you follow-up questions in order to ascertain exactly what you need.